Things are getting spooky this weekend all over San Diego. It's Halloween weekend, and you certainly don’t want to miss out the fun-filled events that are going on throughout the city. Get your costumes out for The Boulevard Boo Parade. This Saturday, October 29th, 2016 will be the 12th year of San Diego’s only Halloween Parade, and it will be loads of fun for the family to enjoy. There will be live music, entertainment, and more spooky prizes for all to enjoy. The Parade will begin at 10 am so be sure to arrive early to ensure that you will find parking. Roads are expected to close at 9 am. There will be free parking at The College Avenue Baptist Church (4747 College Avenue, San Diego CA 92115). 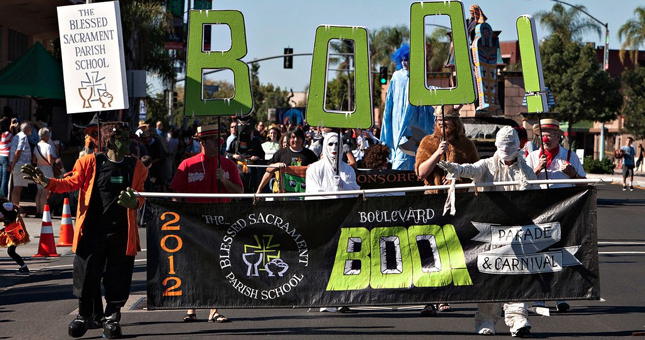 The Boo Parade will travel east beginning from El Cajon Boulevard, crossing College Avenue and conclude at Aragon Drive. This event is FREE, but tickets are available for the Grandstand area. It will be the first time the Boo Parade will have a seating area. Enjoy seating at a central and prime location to view the parade with shade and light refreshments provided by the College Area’s local businesses. Here is a map of all of the roads that will be blocked off.